Updated Saturday July 23, 2016 by AUBL Miami. Giants had bases loaded with no outs in the 1st inning, but only scored 1 run. Puerto Rico came back with 2 quick runs and never looked back. Great pitching from Team Puerto Rico's Mike Casanova. Giants Danger Guevara was unable to repeat his performance from last week vs the Nationals when he earned co-player of the week. A's lose first game of season - Arteaga dominant; Reds come back win 3-1 by Miguel Garcia. In the toughest game of the season for the A's thus far, the A's fell to the Reds on Sunday 3-1. The Reds were able to overcome a 1-0 deficit in the final inning as they scored all 3 runs in the 9th to win the game. The A's were in cruise control most of the game as Alex Arteaga was dominant in his 7 innings as he struck out 9 and did not give up a run and only gave up 4 hits. The Reds' pitching was equally dominant as they only gave up 1 run to the A's in the 5th when Willy Mizrahi drove in Chicho Vengoechea with a single to center after Vengoechea had doubled with one out. Mizrahi came into close out the solid start from Arteaga but some wildness came back to hurt him as he hit 2 batters in the 9th and with 2 outs and the game tied he gave up a 2 run double which led to the win. Offensively, the A's were led by Albert Jardines who went 2-3. Also adding hits were Carlos Alvarez (who reached base 3 times), Pee Wee Rodriguez, Eric Perez and Jose Martinez. The A's are now 3-1 and will look to bounce back next versus the defending champions, D'backs. Marlins came back late in this high scoring affair. Both managers pitched in this game. Eduardo Vinas for The Marlins and Mike Santana for The Jays. The se 2 teams were very evenly matched and look forward to future match ups! Player of the week Los Dodgers Pablo Vinent was 4-5, 2B, HR, HBP, 3 RBI, 3 RS. Both teams had chances to win late, but The dodgers pulled it out with pitching and defense in the late innings. Bears had the winning run on 1st in the 9th inning. Great performance by both pitchers. 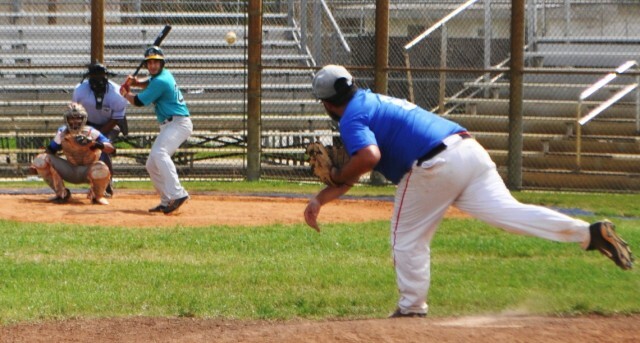 by John Lugo - Miami Twins - The Miami Twins jumped out to an early lead on the North Miami Orioles and captured a 14-7 victory on Saturday at Flamingo Park. The game was decided quickly as the Miami Twins exerted their will early with seven runs in the first three innings. Edward Milian had a busy day at the plate, collecting two extra-base hits. The top of the first saw the North Miami Orioles take an early lead, 2-0. The North Miami Orioles pushed more runs across when they scored on an RBI single. After posting three runs in the fourth, the Miami Twins again scored three in the sixth. In the fourth, the Miami Twins scored on a passed ball, plating Shinhoster Jr.
Indians took control of this game early and knocked out The bombers in 7 innings. The Indians are now 3-1 and proving themselves as contenders this season!